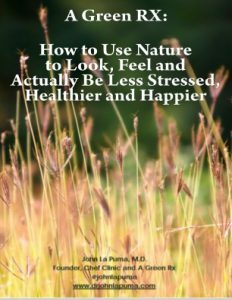 I’ve devoted several blogs to the Mediterranean Diet–its affect on cholesterol, on Alzheimer’s prevention, its red wine and palliation near the end of life, and its easy, rustic preparations. The mechanisms of the Mediterranean diet remain elusive: whether it is because of its vascular effects and metabolic effects in preventing cognitive decline; because of its appetite suppressant effect in obesity and diabetes; its decreased inflammation and oxidative stress effects on heart disease; or its stroke prevention effects. But the component effects of the Mediterranean Diet have seldom been teased apart…for good reason, as the matrix of food nutritional components likely work together to create protection, and likely do not work apart from one another. Clearly, I’m a fan. And so are five Harvard Medical School studies, which taken as a whole suggest it’s what we all should be eating to lose weight and to protect the heart. As long as we like the food. So I compiled 3 sources of reliably Mediterranean recipes: ones that are rich in vegetables, fruits, grains, beans, wine and olive oil but relatively light on meat, dairy, poultry and eggs. It’s been argued that there are 5+ major Mediterranean diets: Morocco, Coastal Spain, Southern France, Italian Riviera, Roman, Southern Italy, Crete, Sicily…wait that’s already 8, and I’m not parsing any geograpical or gastronomic nuances here. So what are the common elements? Tomatoes. Wine. Herbs, especially rosemary, thyme, marjoram, oregano. Olives and olive oil. Legumes. Whole grains. Citrus, if it is not too hot. Tree nuts, usually. Green leafy vegetables. Fish on the coasts, and poultry further in. Home gardening. Using what you have. Trading for what you don’t. Rusticity. In macronutrients: liberal fat (50%+); modest protein (20-25%); the remainder, carbs, largely from whole foods, and forms of pasta or bread. A good primer is from Oldways, the originator of the Mediterranean Diet Pyramid. To assemble these Mediterranean Diet recipes (they need shopping lists too), I relied on very few (close to no) processed foods, as they are not found in any traditional Mediterranean diet. Cooking whole foods is easier than most people know, especially if done in quantity, and then used in multiple recipes. The recipes use the elements of the Mediterranean Diet, and carry its benefits. The recipes I found on 3 sites–Paula Wolfert (who did more to discover and popularize among the cognoscenti and those passionate about flavor than anyone else), Epicurious (whose lust for flavor is central) and my own efforts with ChefMD Mediterranean Diet Recipes are straightforward, tasty and illustrative of the cuisine. And they’re a great place to start to sample different aspects of the cuisine. 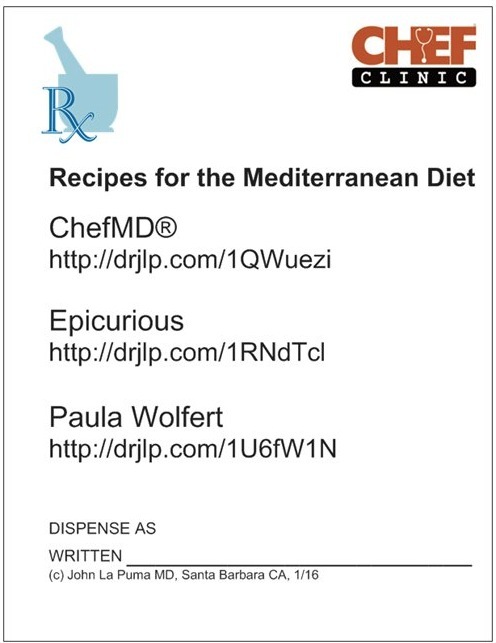 You can print off the Rx for the Mediterranean Diet, and if you’re a clinician, you can order a prescription pad full of them…or just use the clickable URLs by prescription here.